This is the most exciting time in the history of journalism to be a journalist. No matter how much the associated technology changes, journalism history demonstrates that platforms require content. That content is produced by journalists. In the second decade of the 21st century, anyone can be a publisher (Look: I am publishing!). However, not everyone is a journalist. That’s why teaching journalism — and not only to journalists — is so important. Journalism teaches you to write for life across multiple platforms. Know your audience. Write and produce for your audience. That has been my elevator speech since I started teaching in 1986, and I’m sticking with it! I’m especially drawn to the need for journalism that is transparent, honest, aggressive and deep, using all the new tools and with a great sense of openness on how to present the work to an ever-more-digital audience. Well said. I look forward to Sullivan’s upcoming work. 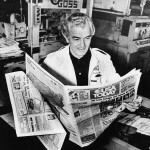 And BTW, the picture is of Al Neuharth reading the first copy of USA Today off the presses in 1982. Imagine that: It was only 34 years ago that USA Today began. And it was wasn’t much later that the question I began with about journalism increased in its frequency.